Experience Certificate holders must log on to BreakawayExperiences.us to activate the Experience Certificate. Experience Certificates may NOT be redeemed directly with experience providers prior to activating the Experience Certificate. Each certificate will show a package description and a certificate number. You will be asked to register with Breakawayexperiences.us in order to activate the Experience Certificate prior to contacting the experience provider to schedule the experience. The certificate holder must contact the venue to schedule the experience. At the time of the initial contact the certificate holder must provide the venue with the specific number of the certificate. Only activated certificates will be accepted. The certificate must be presented to the venue at the time the services are being performed or the experience is provided. Gift Certificate holders must log on to BreakawayExperiences.us to utilize the Gift Certificate(s). Gift Certificates hold no monetary value and may only be applied to the purchase of Breakaway Experiences' experiences. Gift Certificates may NOT be redeemed directly with experience providers. The balance on the Gift Certificate(s) will remain until fully used. 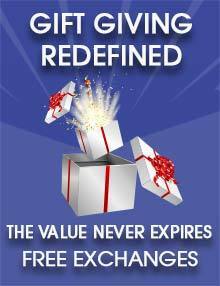 Gift certificates are non-refundable and have no expiry date. During the activation process, the recipient will have the opportunity to exchange the experience for another experience. Should the recipient decide to exchange the experience purchased for another experience, the recipient will receive a Breakaway Experiences Gift Certificate for the value of the exchanged experience at time of purchase. The amount credited in the form of a Breakaway Experiences Gift Certificate has no monetary value and may only be used to purchase experiences from BreakawayExperiences.us. When an experience certificate is exchanged, the existing experience certificate number is null and void. A new experience certificate number will be issued when a new experience is purchased. Once an experience certificate has been activated exchanges are not permitted. Should the Experience Certificate recipient choose to exchange for a more expensive experience, he or she will simply need to pay the difference in cost. Should he or she exchange for a less expensive experience, the remainder may be used until the balance on the Gift Certificate is $0.00. Experience Certificates are valid for twelve (12) months from date of purchase unless otherwise indicated on the venues Terms & Conditions. Following the expiry date, Experience Certificates are only valid for the value indicated on the experience certificate and you will need to pay the difference between the amount indicated on the experience voucher and the current selling price of the experience in order to use it. Gift Certificates for Breakaway Experiences have no expiry date. Experience Certificates or Gift Certificates that were purchased or awarded as part of a promotion, special or charitable event cannot be extended or reinstated after their original expiry date. All sales are final. Payments are non-refundable by Breakway Experiences. Breakaway Experiences does not process any returns or reimburse any payment transactions on any purchases of experiences or Gift Certificates. Experience Certificates that have not been Activated can be exchanged free of charge -- see Exchange terms above. Please Note: It is the responsibility of the purchaser to ensure that the correct email was entered during checkout. Breakaway Experiences will not be responsible for gifts sent to wrong emails. Purchasers can resend the gift experience via email from their Experience Certificate Dashboard under My Account until someone validates the gift with the 4 digit validation code. Once your booking has been made, if you cancel it, you may incur a cancellation fee from the experience provider involved. You must contact the experience provider directly with any cancellation requests as Breakaway Experiences is not able to handle these on your behalf. You will also be required to deal directly with the experience provider should any re-scheduling of your experience be necessary due to bad weather or other unforeseen circumstances. You will have full experience provider’s contact details on your experience certificate. Our experience providers operate under their own cancellation policies which you will need to adhere to. Breakaway Experiences will not reimburse any traveling, accommodation or other expenses incurred by you or any other person in the event of a cancellation. Gift certificates and the associated references must be kept safely and securely. Once a certificate is used, it cannot be re-loaded. Breakaway Experiences will take no responsibility for any loss you may incur as a result of certificate theft, copying, or identity fraud. Any modification of a certificate will result in it being deemed as void. Breakaway Experiences reserves the right to decline and/or refund any Breakaway Experiences product. Only one valid Breakaway Experiences’ promotional discount or discount code can be applied per order and can only be used if a discount has not already been applied. They may be subject to promotion specific terms, conditions and validity periods and may be withdrawn without notice at any time at the discretion of Breakaway Experiences. Certain experiences are subject to minimum or maximum requirements specified by our suppliers; e.g. age, health, height or weight. The venue will confirm with you at the time of booking or on the individual venue Terms and Conditions if any restrictions apply to the participant. Once booked, you may be liable for charges if you cancel because the minimum requirements are not met. We welcome the participation of people with disabilities in our experiences, though we recognize that certain experiences may present difficulties for those with disabilities. We are committed to ensuring that customers with disabilities are given every opportunity to participate, so we ask that you tell us about any relevant disability at the time of ordering. This enables us to do our best to meet the participant’s particular needs. Should an experience not be possible for a person with a disability, BE will allow the person to exchange the experience for one of equal value. The information provided by BE on our web site about each experience is correct at the time of posting. However, the content or format of experiences may change over time. Current details of each experience are available on our website. Your participation is conditional on your acceptance of the experience description detailed in your certificate description. Please check these details carefully upon receipt. Breakaway Experiences reserves the right to delete, add to or otherwise change the description, terms and conditions and the prices for any Breakaway Experiences’ Experience without prior notice. Breakaway Experiences shall use commercially reasonable efforts to update the Website to reflect any deletions, additions or other changes to the description or price for any Breakaway Experiences’ Experience; however, the Provider shall be ultimately responsible for the accuracy of the description of the relevant Breakaway Experiences’ experience, including without limitation, the exact location, estimated duration, waiting times, instruction requirements, minimum and maximum number of other participants and any other limitations, restrictions or requirements related to the relevant Breakaway Experiences experience, such as age, height, physical condition, weather or other limitations, restrictions or requirements. The images used to illustrate tangible gifts or experiences, particularly those that take place at more than one location, are used as an indication only. The vehicles, craft, machines, animals and settings at each venue do vary. The text, illustrations and images used in all BE promotional literature are protected by copyright and must not be copied in whole or in part without the express permission of BE. The Breakaway Experiences’ experience providers include many of the best experience venues. We are always adding to the locations we offer, but occasionally we may need to withdraw venues featured here for reasons beyond our control. If your preferred location is withdrawn, you will be offered alternative venues wherever possible, but please note this is likely to be at a different location or with a different supplier Each venue has its own terms and conditions and your participation is conditional on your acceptance of these. Providers may cancel a booked Experience for any reason without notice. In such event, you shall be entitled to re-book your Experience in accordance with these Terms and Conditions. Breakaway Experiences shall not be responsible for any losses, damages, expenses or liabilities you incur in connection with a cancelled Experience. Some experiences are dependent on the weather. If your experience is cancelled due to the weather you will be able to re-book, but your re-booked experience remains subject to weather conditions. It is the responsibility of the Participant(s) to confirm their reservation with the Experience Provider if there are any weather related issues or questions on the day of the reservation. All our experiences are offered subject to availability. To attain the preferred dates, please book as early as possible, preferably at least 28 days in advance or further for peak dates such as weekends or holiday periods. Breakaway Experiences makes no claim or guarantee as to the availability of any specific Experience or that it will continue to be offered by the Experience Provider. Where specific elements of the experience such as vehicles or celebrities are not available due to mechanical breakdown or illness, we reserve the right to make reasonable substitutions on the day. If this is not possible we reserve the right to cancel the experience at short notice. We welcome your feedback on all of our experiences. If you have a problem or complaint on the day, please bring it to the attention of the host or experience manager at the venue as soon as possible, so that they have a chance to put matters right. If your problem is not resolved on the day, please contact our Customer Service department, including your certificate reference, participant and venue details, and we will be happy to take the matter up with the supplier. In general, we consider it unreasonable if you take no action during an event, but then make a complaint at a later date. All prices quoted on our website are subject to taxes where applicable and are correct at the time of publication. We reserve the right to increase the price of any experience without notice. While we take every care in choosing our experience suppliers, inclusion of an experience in our range does not mean that we guarantee the safety standards or satisfactory performance of any of the experience suppliers. BE’s liability for any claim of breach of obligation regarding any single certificate or experience shall not exceed the price of that experience. This excludes claims arising from personal injury or death due to the negligence of Breakway Experiences or anyone for whom Breakway Experiences is responsible. By the use of the certificate you hereby release and hold harmless Breakway Experiences and it's licensees from all claims, foreseen or unforeseen, sustained, incurred or suffered, directly or indirectly, or in any way or manner whatsoever, as a result of the, caused by or related to or arising from the provision or refusal to provide the experience by the venue. All the above terms and conditions apply as a condition of using any gift certificate or experience certificate, whether or not the gift certificate or experience certificate holder is the original purchaser. Breakway Experiences reserves the right to change these terms from time to time without reference to customers. These terms and conditions do not affect your statutory rights as a consumer, and are governed by and in accordance with Canadian law. The purchaser and Breakaway Experiences agree that any problems fall under the jurisdiction of the laws of Ontario.